Dallas, TX, March 21, 2018	(Newswire.com) - PayNet, the leading provider of small business credit assessments on private companies, announces that in January 2018 borrowing is increasing in Texas, with 10 of the 18 major industries rising in the state. Texas' PayNet Small Business Lending Index (SBLI) registered at 123.7, increasing 1.3% from the previous month's state level and 21.7% greater than this month's national SBLI level (101.7). Accommodation and Food Services (28.0%); Arts, Entertainment, and Recreation (23.3%); and Mining, Quarrying, and Oil and Gas Extraction (22.1%) were the industries with the largest improvement in lending activity over the past year in Texas. In addition to having the second-greatest improvement this month, Arts, Entertainment, and Recreation also recorded the highest lending activity (228.1) of all industries in Texas. 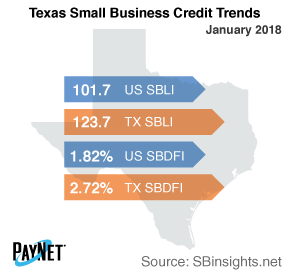 After a comparable performance to December, Texas' PayNet Small Business Default Index (SBDFI) of 2.72% ranked last in the country and was 90 basis points above the national SBDFI level of 1.82%. Year-over-year, the national SBDFI fell 2 basis points, while Texas' SBDFI fell 50 basis points. "Rejuvenated investment means Texas is well positioned for a positive lift in the economy," explains the president of PayNet, William Phelan.